Editor’s note: The Romans Group has issued its 11th annual review of the collision industry, and founding partner Vincent Romans has allowed us to reprint the report summary as a guest column. Whether you’re a member or owner of an MSO, considering selling to one or joining a franchise to retain ownership, or determined to continue as a true independent, the market information presented here might help you plan your business strategy. 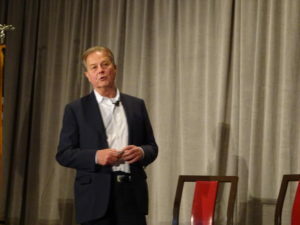 Consolidation within the collision repair industry is slowing and we now have at least one “category killer” among the four largest multiple-location consolidators. MLO consolidators have altered their market development and growth strategies from primarily acquiring large multiple-location operators, MLOs, as a quick way to enter new markets and shore up and expand existing first‐tier markets. Their network development strategy now includes a combination of continued aggressive organic growth and selectively building out and expanding existing markets to include “cluster and tuck ins” which are based more on single-location acquisitions, brownfields, and greenfields. Industry contraction has stabilized. As a result, we see a temporary market equilibrium resulting in a slowdown in the rate of loss of collision repair facilities nationally. The current encouraging health of the collision repair market is due in part to an increase in accident frequency and the upward trend in vehicle repair severity. Nevertheless, we remain certain of the path forward involving the continued long-term, multi-segmented market’s structural transformation throughout the entire auto physical damage ecosystem for all companies providing products, services, software, and technology that in any way touches cars in the U.S. and Canada. Since 2006, the total growth within the four U.S. segments we track and analyze; four independent consolidators, ≥$20 million multiple-location operators, MLOs, franchise and banner groups, and $10-$19 million MLOs which we did not track in 2006, have grown from $3.8 billion to $11.7 billion in market share, an 11.9 percent compounded annual growth rate. 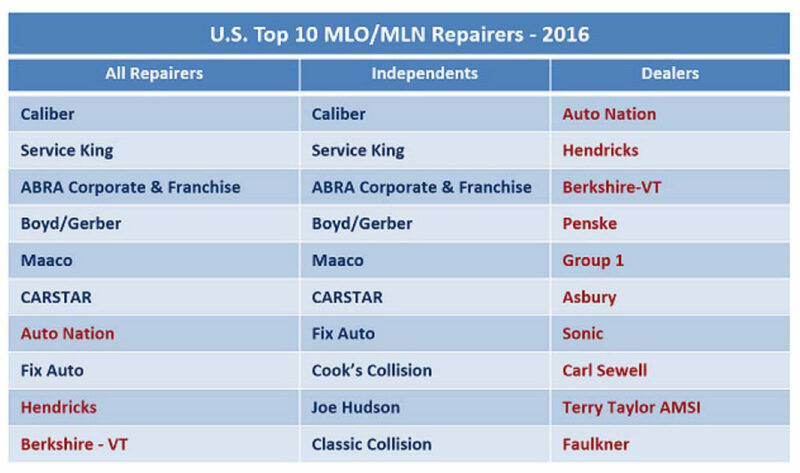 The top ten ranking of all ≥$20M segment repairers including independents, dealers and franchisors can be seen in the table below. Under the All Repairers column, we see there are four independent consolidators, three independent franchise organizations and three dealer groups. Within this ≥$20M segment, the four independent consolidators represent well over half of the revenue processed in 2016. We estimate that by 2021, the four consolidators could represent nearly a quarter of the market. When combined, the four segments we track and analyze could represent, on an aggressive market gain basis, up to 50 percent of the collision repair industry by 2021. The following chart reflects the ranking of the Top 10 multiple-location operators and networks for 2016. The Canadian market continues to consolidate with the franchise and banner segment now representing over half of the Canadian private insurance and consumer-paid auto market. When you add the ≥$10 million MLOs in Canada, the combined larger segment has a significant majority share of all the private passenger insurer and consumer‐paid market. We see a combination of banner, franchise and independent groups represented in the Top 10 ranking category. 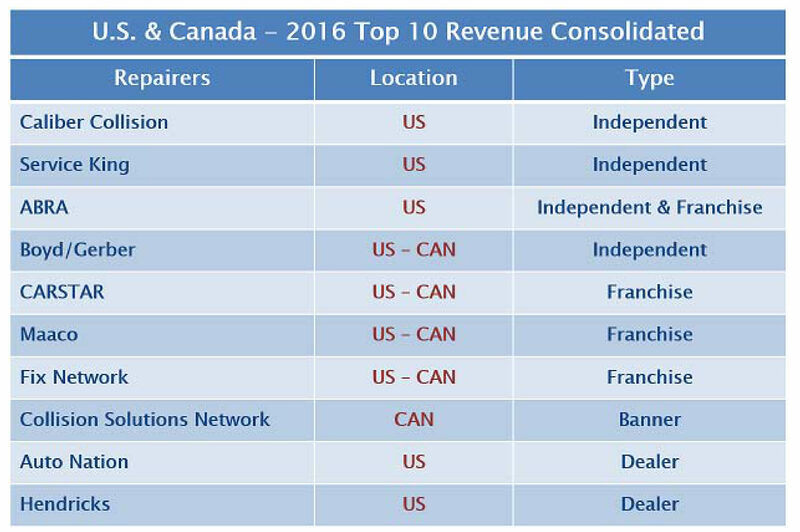 Although the U.S. has seen an increase in consolidation within the multiplelocation operator segments, Canada remains significantly more consolidated in the revenue generated by the combined franchise and banner and ≥$10 million MLOs. In Canada, this combined segment group represents a market share more than double that of the same U.S. segments. Within the U.S. market, the ≥$20 million independent and dealer MLO segment is the largest while the franchise and banner network MLOs remain the dominate business model in Canada. When ranking all repairers for the U.S. and Canada, and consolidating those that operate in both countries, four operate in both the U.S and Canada while five are in the U.S. only and one is solely in Canada. These Top 10 U.S. and Canada combined repair organizations have experienced a $3.3 billion revenue increase since 2012, generated through 1,049 more locations than in 2012. 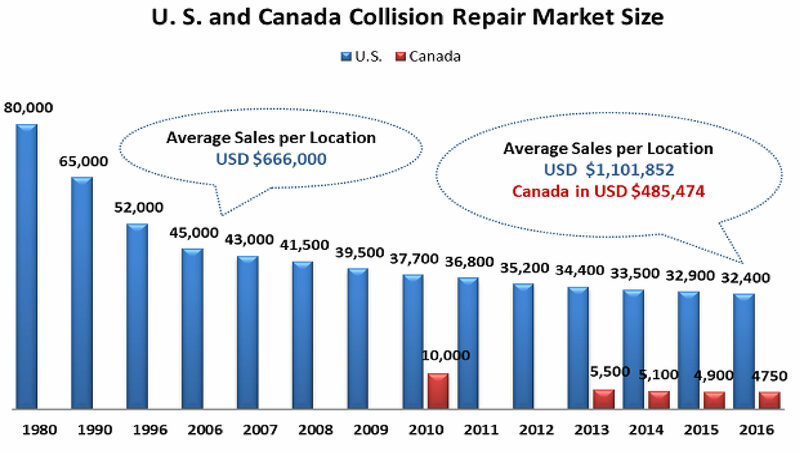 Since 2010, Canada has lost just over 50 percent of its collision repair locations, dwindling from 10,000 to 4,750. Compared to the U.S., Canadian average annual repair revenue in 2016 was $485,474 per location, 55.9 percent lower than the U.S. average of $1,101,852. As a sign of ongoing consolidation, the average revenue per repair facility for both Canada and the U.S. has been steadily increasing over the last few years. The pace of collision industry consolidation and contraction has shown signs of slowing down over the past 18 months. MSO consolidators will continue to grow and will do so in the immediate future through single shop or smaller MLO platform acquisitions, brownfields, and greenfields. The number of qualified and willing MLO sellers and the consolidator MLOs’ changing appetite for paying what they perceive and believe were, and still are, seller‐inflated price expectations, will put pressure on any high level of activity for platform transactions in the near term. Occasionally, a large market leader or collision repair organization providing a new or extended market platform entrance, such as Assured Automotive of Ontario, Canada, recently acquired (July 2017) by the Boyd Group, may realize higher-than-average platform valuations. We believe that the market segments profiled within our report will continue to gain share within the collision repair industry and expand their revenue base. This will be accomplished with growth coming from acquisitions, brownfields and greenfields and by adopting a diversification strategy that leads them to incorporate both new competitively advantaged collision repair process models, and/or extended differentiated lines of business services. The “Advancing Our Insights into the 2016 Collision Repair Marketplace” full report can be obtained by calling 847-382-6208 or emailing MaryJane@romans‐group.com.